How do individuals conceive their world and their place in it? In an attempt to identify the worldview of the Batek tribe, a team of researchers from the Academy of Language Studies embarked on a comprehensive study to document the characteristics and elements found in Batek folklore. 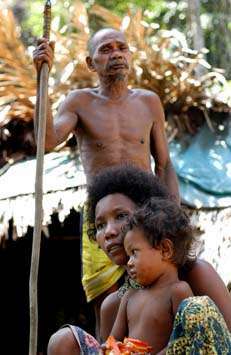 The Batek tribe, a microcosm of the Orang Asli community, have been much sidelined in major researches, thus providing much incentive for such research to be undertaken before the Batek tribe and its culture succumb to delibitating change. Exploring the relationship between superstitions, the supernatural world and culture, the team, comprising of Noreha Taib, Wan Latifah Wan Ariffin, Mohd Radzi Manap, Aini Akmar Kasim, Ismie Roha Jais, Azhar Abdul Wahab and Mohd Sofian Abdul Latif, draw on oral literature, in particular the eighteen stories recounted by Tok Batin Mahad, the head of the Batek tribe in Taman Negara, Pahang, to produce this socio-cultural study. The study provides an intriguing insight into the diverse elements found in Batek folklore. Twenty three elements including folk botany, traditional narratives, supernatural beings, sorcery and witchcraft, the physical world, the earth, the material world, animal folklore, fire, hypnotism and animal magnetism, the human body, life and death, folk medicine, traditional customs and ceremonies as well as folk sayings form the core of the stories. The stories also demonstrate the belief that the origin of the physical world is a consequence of the play of supernatural powers among humans, thus providing explanations for the unknown. The narratives presented within this study also challenge established perceptions about human relationships; as in the role of the younger son as the protaganist, often solving the problems started by the eldest brother. The eldest brother is potrayed as strong and brave but rash and it is the youngest son who has supernatural powers and is depended on to solve family feuds. It follows that in Batek Folklore, the youngest son is accorded a hero status. Lastly, an analysis of the folklore of the Batek people unravalled the influence of religion and culture within the tribe. Although according to official policy, all Malaysian citizens remained locked in their ancestral ethnic category, under the influence of a more recent Islamic resurgence, there has been a process of increasing assimilation of the Islamic religion and practices amongst the Batek tribe. What the reseachers have done in this study goes beyond merely documenting, collecting, classifying, and cataloguing information. Using fieldwork, the researchers attempt to obtain a perspective based on insider discourse and practice, in order to provide a more complete context by which to understand the people and their cultural productions equally. Multiculturalism is one of the touted traits in Malaysia; Malaysia, Truly Asia. Anyone interested in multiculturalism in Malaysia will find this study of enormous value as it presents a concrete distillation of the history of the Malaysian ethnographic landscape. Such studies should be made available in all general reference libraries as well as ethnic and social science libraries for the unmasking of such folklore traits may lead us to better understand the past, ourselves and others.